So much more than a typical panyasan, the Jiyugaoka Bake Shop opens its elevated fourth-floor expanse to present a bright and fully serviced café. Light pours in from the floor-to-ceiling windows—and more illumination can be found on the 17-seat open-air terrace past the tempting bake display, a cozy spot for a mid-afternoon nibble. The ample food menu offers everything from asparagus and bacon risotto (¥1,100) to eggs benedict (¥1,260), while New Yorkers might enjoy the sight of potato knishes with salad for ¥850, proof positive of the baker-owner’s time in the Big Apple. The aesthetic presentation is impeccable—though sometimes the visuals raise the bar a little too high: As nice as it looks, the Bake Shop Full Breakfast (¥1,500) is essentially just an artistically arranged collection of ordinary eggs, toast, fried potatoes and nearly-noteworthy sausages shored up by a limp salad. The true excellence of the Bake Shop arises from its drinks and desserts. There are ten teas on offer, including wild raspberry, hibiscus and berry “super fruits” and even “Red Dusk” Rooibos tea for any homesick South Africans out there (¥700 each). The “Passion & Beauty” passion fruit tea treads the perfect line between sweet and strong without any need for sweeteners. There are also eight kinds of Guatemalan coffee (¥400-680) with decaf and organic soy milk options, a variety of organic juices (¥700), yogurt smoothies (¥850) and a small beer and organic wine list, with amber brews including Kronenbourg White from Alsace, Germany’s Schöfferhoffer Grapefruit (¥950 each) and a seasonal American IPA (¥900). Desserts include caramel crunch banana bread, a peanut butter and jelly bar (¥600 each, with homemade whipped cream), and—get ready for it—an apple and rhubarb crumble with ice cream (¥680) made with homegrown rhubarb. 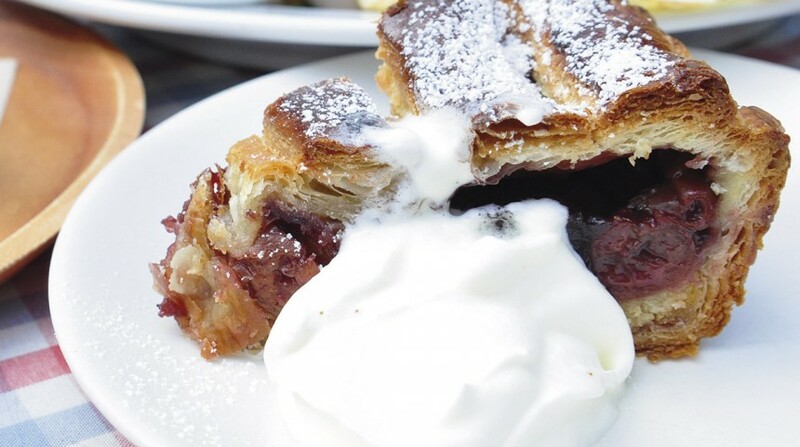 Also noteworthy is the cherry pie (¥600, with whipped cream), which is neither too sweet nor too tart, and is wrapped in a tender yet flaky pastry crust. Everything on the dessert menu—and more—is available to take home from the bakery counter, and we left with a bag packed with corn bread (¥380), chocolate chip scones (¥250) and some more apple rhubarb crumble (¥380). The selection changes daily, so there’s always something new in store. The Bake Shop is just five minutes’s walk from Jiyugaoka station’s main exit, taking you past a delightful selection of confectioners, lifestyle shops and niche toy stores that will give you plenty to do on the way.